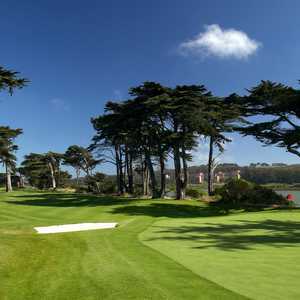 SAN FRANCISCO - Certain San Franciscans regard Harding Park Golf Course with such reverence that any criticism is decried as blasphemy. Well, here's blasphemy. Harding Park's renovation is nice. Maybe even worth the $16 million it took (if it's not your $16 million, it's always worth it, right?). Nevertheless, this course is getting seriously overrated. Once again, it's a nice, interesting play made more so by its standing in San Francisco. But to call it the third-best muni in the country behind New York's Bethpage Black and San Diego's Torrey Pines, as some publications have done, qualifies as pure fanciful lunacy. This ranks as the equivalent of declaring Ashton Kutcher the next James Dean. Kutcher may make a few teenage girls (and Demi Moore) swoon, and he's funny pranking mostly C-list celebrities, but let's keep things in perspective. That is what's missing in the wake of Harding Park's very public, relentlessly promoted revamp: perspective. The favored child of the San Francisco city municipal golf scene, Harding Park's been open for about 21 months since the redesign. That's more than long enough to see the praise campaign hit hyper-drive. Harding Park's received the kind of press, new popes and old prime ministers only dream about. It's one thing for former San Francisco mayor Willie Brown, a noted master of exaggeration, to crow, "It's the finest municipal course in the land." It's quite another for a string of national golf publications to blindly follow Slick Willie's lead. Golf Digest's Ron Whitten used the words "resurrection, revival, restoration and renovation" so often in his gushing tribute, that I thought he'd stumbled into a screening of NBC's "Revelations" rather than a golf course. It's exactly that kind of thing that sets Harding Park up for failure. 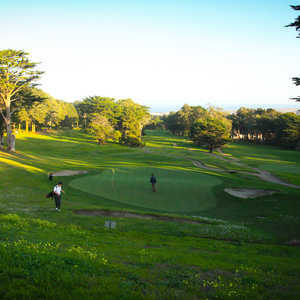 If you happened upon this course with large, well-tended greens and a few truly riveting holes on the back nine for $78 in San Francisco, you'd think you had a great find. After all, it's expensive to simply breathe in San Francisco as a tourist. (That will be an $8 tax for use of city oxygen, please!) Only the problem is Harding Park will never be a neat discovery, its renovation hype guaranteeing it will be held up as the best of the best. And in this light, Harding Park comes up short. It's no Bethpage Black. It's no Torrey Pines. In truth, it isn't even the equal of its maintenance-challenged sister San Fran muni Lincoln Park. If you took Lincoln, with its majestic views of the Golden Gate Bridge and the boats in the water and removed all the white dandelions burying its fairways, you'd have a wonder greater than Harding Park at its best. Just don't say that around certain San Franciscans. They're likely to break into stories of how their daddy played Harding Park and their granddaddy played Harding Park before that and someday their granddaughter's going to play Harding. "Harding Park is San Francisco," local Rich D'Nunzio said. "It's San Francisco right down to the roots of the cypress trees. That's all well and good, but it's no reason for visitors to pay the more than double non-resident greens fee ($33 for locals). Attracting out-of-towners stands at the heart of Harding Park's plan of paying off its loans. Under the vision of Kemper Sports Management, the company running the course for the city, tourist golfers will make up 35 percent of Harding Park's players. It's worthwhile to be part of this 35 percent. As long as you don't go in expecting a course for the ages, you'll be impressed with Harding Park. Especially the back nine. Harding eases you into the round, makes sure you're warm and comfortable before hitting with the real tests. At No. 14, a 440-yard par 4, you shoot down into the fairway and then back up to a raised green. It's like playing golf in a chute, with all kinds of chances for trouble. The biggest changes in the renovation come in the size of the greens. There's plenty of room now, plenty of opportunity to tinker with pin placement when the pros arrive here for the 2005 World Golf American Express Championship in October. The possibility of landing this AM-EX tourney and other major golf events in San Francisco drove the $16 million spruce up. There's talk of hosting a U.S. Women's Open and rather far-fetched talk of a men's U.S. Open. All of this, fueling the dreams of politicians. "Are you one of those guys who's going to write how great our course is now that it's too crowded to play it?" golfer John Reece said. "Look at this place." Yes, there are practical disadvantages to hype gone wild. Harding Park is even more crowded than before and some veteran San Francisco golfers wondered if that was even possible. This is a round where it's best to bring your patience right along with your sand wedge. You could have plenty of opportunity to soak in the views of Lake Merced that seem to be available on every hole of the back nine. There are also complaints of the greens being spotty - good one week, so-so the next. People expect a lot for $16 million and there's worry the course will only be in really top shape when the major events roll around. That's forgetting where Harding Park came from though, losing sight of what it's all about. This is still a muni course for the city and if you can't deal with a few hackers who are just learning their way into golf, you should be playing somewhere else. Golfers who keep the right attitude will be rewarded like usual when they reach the 18th tee. The redesign moves the green back to the old practice green and the added yardage makes for a very demanding hole indeed. 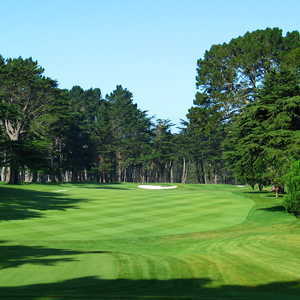 At 440 yards from the back tees, the dogleg left is visually intimidating, with the Lake Merced and cypress trees just daring fools to swing too bold. It's an exhilarating finish to a satisfying course. Just not a course equal to some of the recent ridiculous claims. Planning a trip to San Francisco just to play Harding Park the way some golfers plan a trip just to Long Island to play Bethpage Black or San Diego to play Torrey Pines is not likely to become a trend anytime soon. Despite the hype, Harding Park is not worthy of that kind of travel arranging fawning. But if you find yourself in San Francisco, by all means play Harding Park. Play Lincoln Park too, even with its dandelions and tattered fairways, but work in Harding. It's an interesting course with plenty of history. One of the best things about it is how it seems to be made for walking. There's nothing like getting out on Harding with a few buddies, hauling your own bags, and soaking up the San Fran air. One of the bonuses of Harding Park is that you know you're in San Francisco when you play here. It's not a cookie-cutter resort course cut off with all contact from the city. On some of the holes you can see out onto the distinctive city architecture. This is a fun course, full of life. You just wish it didn't carry the burden of its pumped-up press clippings. Apparently, $16 million can drive a lot of people to hyperbole. There are much worse ways to start or finish a day than walking into the old ferry building along the pier and taking in the bustling, buzzing city market. You can get all types of fresh fruits and exotic cheeses here, more than enough to stock up for your own picnic along the water. For those looking for an indoor sit-down meal, there's a very popular wine bar and other restaurants. Avoid the seafood shop though. Its New England clam chowder makes some chain restaurants' versions look good. And the fish and chips aren't much better. For some of the best dim sum in the country, hit Yank Sing ((415) 957-9300) on Spear St. and Mission. The small dishes wheeled along the room on carts and chosen at your whim make you realize why people have been love with the dim sum experience for generations. The pork buns are particularly tasty. The Omni ((415) 677-9494) in the financial district provides some shrunken rates (for San Francisco) for some super-sized rooms (for San Francisco). The hotel staff couldn't be friendlier with offering suggestions on places to eat. Pay particular attention to their low-key hamburger joint recommendations. Just avoiding getting suckered into the $45 valet parking charge (there's a garage you can use right next door for $28 per day). If you're into the price-is-no-object thing, the Campton Place Hotel ((415) 955-5536) and its $345 rooms is the place to be. Having undergone an extensive $15 million renovation three years ago, this 110-room boutique hotel specializes in luxury and a personal service level you cannot find in even the nicer, larger, chain hotels. Sandy Tatum, the former United States Golf Association President and San Francisco fixture, led the renovation drive. I enjoyed Harding on a recent trip, but I thought Presidio Golf Club was slightly better. Some great views and excellent golf course. As far as Lincoln goes, it's a disgrace to have such a beautiful site in such poor condition. What are the powers-that-be thinking? Millions of dollars could be made there! I find it unbelievable that you think Lincoln Park Golf Course is in the same league with Harding Park. Lincoln plays like an executive track relative to Harding. Yes, there are some spectacular views at Lincoln, (17th hole looking at the GG Bridge) however Harding is much more visually appealing from a players eye. It is obvious that you have not spent much time really learning the course (s) and doing your homework on these two layouts. I respect your right to be so opinionated (mostly negative) on different subjects, however in this instance you cannot back it up. Did you even play these courses more than once, or at all? Are you the same Ed Roseborough that grew up in Park Merced from 1958 to 1962? If so, drop me an e-mail because we have a lot of catching up to do! Th only great golf course by Lake Mercid is SFGC. But alas, mere mortals can't partake. However, we in Chicago aren't underserved. With muni (defined as government entity owned, public courses) offerings like George Dunn (Forest Preserve) National or the 36-hole Harborside International (Illinois International Port District) why go to the coasts? I'd count Olympic Lakeside (Lake Merced!) as "nearby" and certainly a great course. SFGC is a true gem but as difficult to get on as Augusta or Pine Valley. "Fanciful Lunacy" comparing Harding to Bethpage Black, but every bit as much Fanciful Lunacy to put Torrey Pines in a class with Bethpage Black!